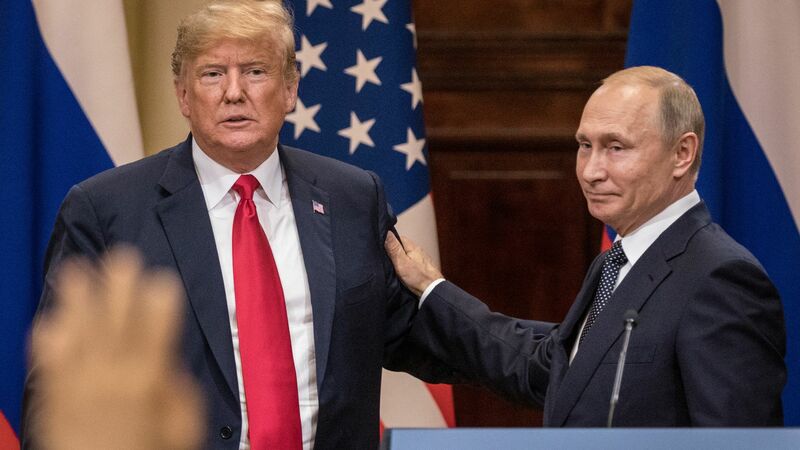 In an interview that just aired on Fox News, Russian President Vladimir Putin told Chris Wallace that Western efforts to isolate Russia have "failed," and he began down a "new path" today with President Trump. In the press conference, Trump said "both countries" were to blame for the current frosty relations. He also said that while his advisers tell him Russia meddled in 2016, Putin tells him it's not true and "I don't see any reason why it would be." Putin, for his part, said he had wanted Trump to win the election, but denied ordering any election meddling. Alina Polyakova of Brookings puts it this way: "This is the press conference Putin has been waiting for his whole life." One tense moment: Wallace presented Putin with the indictment brought against 12 Russian intelligence operatives for their role in the election meddling. Putin refused to touch it, and dismissed the Mueller probe as "the internal political games of the United States." Richard Haass, writes for Axios Expert Voices: "The summit should not be viewed in a vacuum. It was a worrisome and in many ways objectionable finale to a week that did much to undermine the foundations of U.S. foreign policy — especially NATO and the U.S.–U.K. special relationship — that have contributed so much to U.S. security, prosperity and influence for the better part of a century. Alas, the trip provided nothing that would take their place." Go deeper: Trump's Helsinki humiliation. In recent weeks, I've covered the trials and tribulations of Angela Merkel, Theresa May and Donald Trump. So it seems like a good time to compare the relative popularities of some leading world leaders. After a spat with Trump and his move to legalize marijuana, Canada's Justin Trudeau is flying high. He sits at 55%, per Ipsos. Japan's Shinzo Abe, whose approval had tanked over corruption allegations, has surged to 52%, per Nikkei, ahead of a leadership race in September. Merkel remains Germany's most popular politician, with a recent poll putting her approval at 48%. France's Emmanuel Macron has a 40% approval rate, per Ifop, and has been damaged by claims he's "president of the rich." Perhaps Sunday's World Cup win will help. May is viewed favorably by just 25% of Brits, per YouGov. Fortunately for her, there are few popular alternatives. Trump's approval sits at 43%, per the RCP polling average. 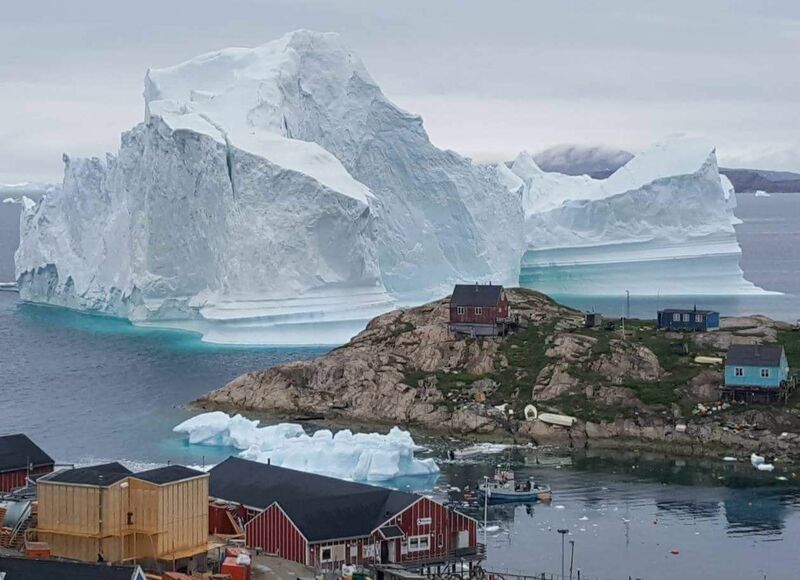 An 11-million-ton iceberg is threatening Innaarsuit, Greenland, a small village with 169 permanent residents. Claudia Sheinbaum, who was elected Mexico City's mayor, and Andres Manuel Lopez Obrador, who was elected president. Photo: Manuel Velasquez/Getty Images. In Mexico, much of the post-election focus has been on how Andrés Manuel López Obrador will govern (the leftist president-elect is getting right to work, and selected Marcelo Ebrard, considered a moderate, as his foreign minister). But Eurasia Group's Willis Sparks points out in the latest Signal newsletter that a huge political victory for the Mexican women is flying under the radar. The facts: In the next Congress, women will make up 47.8% of the lower house, 49.2% of the Senate, and at least 50% of most state legislatures. López Obrador's old job — Mexico City mayor — will be held by a woman, Claudia Sheinbaum. This breakthrough has been a long time coming. For 15 years, Mexico has had mandatory quotas that require each political party to include a set percentage of women among its candidates for office, but Mexican women have long complained that female candidates lacked critical support from their parties. Pressure for change has now produced a positive result. But that’s not true in Brazil, where female participation in politics remains a source of national embarrassment. Women make up a little over 10% of the lower house and just under 15% of the Senate. Just one of 29 members of President Michel Temer’s cabinet is a woman. Kenya ranks toward the back of the global pack when it comes to corruption (just behind Russia and ahead of Nigeria, according to Transparency International) and President Uhuru Kenyatta and other top officials are under pressure to do something about it. Enter the lifestyle audit, which the Washington Post describes as "an anti-graft initiative that, if implemented, would require every government official to show how they earned enough to afford the mansions, ranches and luxury cars so many of them own." Kenyatta says he'll undergo an audit, though there's plenty of reason to be skeptical. Kenya's debt is also spiking. 72% of it is owed to China, according to Quartz, as the Asian giant swoops in with easy money to fund infrastructure projects. A recent headline from Kenya's Standard newspaper declares, "Kenya’s indebtedness to China may evolve into national security threat." Why it matters, from Axios' Erica Pandey: Kenya is one example of China's larger strategy to win influence across the world. Beijing accrues massive amounts of a smaller, poorer country's external debt, then leverages that debt for influence in trade, domestic politics and beyond. 5. Europe: Will Brussels cut May a break? Those six goals are as many as were scored in the last four finals combined. VAR (video assistant referee) played a crucial role in this game, as in several others this tournament. A handball in the box caught on video but not by the referee's naked eye led to a penalty, and France's second goal. VAR has divided fans all tournament. I tend to think it's a good thing. France, which won previously in 1998, joined Brazil (5), Italy (4), Germany (4), Argentina (2) and Uruguay (2) as a multiple World Cup winner. Belgium beat England 2-0 Saturday in the third place game. They were sensational to watch all tournament and could easily have won it. The next World Cup will be held in the winter. That's because the delightfully corrupt (allegedly) powers-that-be at FIFA gave the bid to Qatar. Mark November 21, 2022 on your calendars. This was a wonderful tournament full of engaging storylines and a whole bunch of goals. It was statistically the best ever, according to the BBC. I hope you enjoyed it as much as I did. Ex-prime minister Sharif arrested on return to Pakistan. U.S. turns down European requests for exemptions to Iran sanctions. The devil's bargain for AI companies working in China. Haitian prime minister resigns following riots. Canada's largest store chain drops Ivanka Trump’s products. Trump administration to seek direct talks with the Taliban. IMF lowers prediction for Europe's 2018 economic growth. “He told me I should sue the EU." — Theresa May on Donald Trump's advice on Brexit.